The fifth square for the Wrap That Baby in a Community of Love Blanket has been finished--mine! 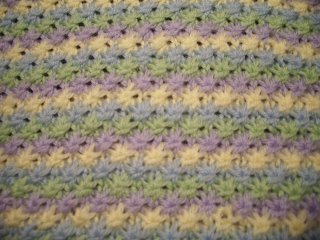 I used all four colors and the photo has a close up of the stitch. 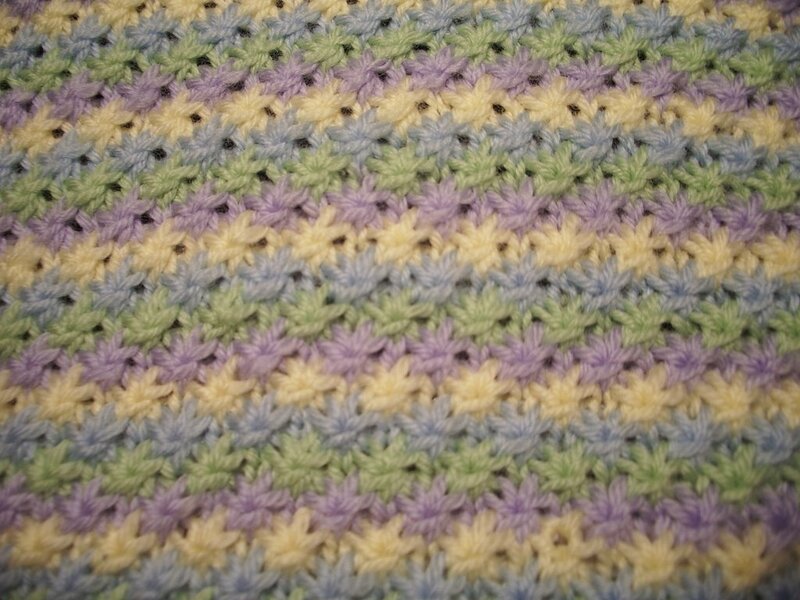 Same stitch for the entire square. 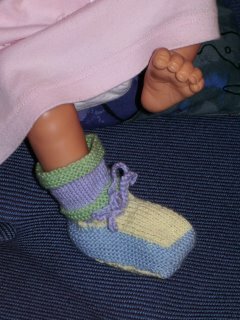 I had a little left over yarn and decided to make booties to match the blanket! The bootie is being modeled by my daughter's favorite doll. Also, surprise! 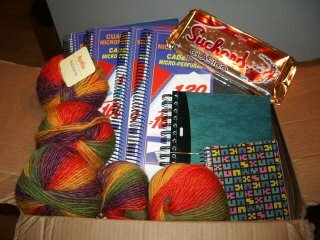 Just in time for Three Kings' Day, yesterday a wonderful package came in the mail, from Spain. Betty kindly sent me some European notebooks for my daughter, who fell in love with the small checked note paper while in Spain last year. Alas, this type of notebook is not sold in the US, as far as we could find. Betty generously sent five notebooks and some smaller ones, along with glorious Katia yarn (made in spain and sent directly to me from Spain!! ), and a delicious turron--a thick chocolate bar mixed with nuts sold at Christmas time in Spain. Look at that gorgeous brightly colored yarn! I can't wait to put it on needles. the package weighed a ton, full of greatly appreciated items.mmThank you! Gracias! Merci! Betty is a great and generous friend who has lots of energy and talent. Check our her blog at www.sincontrol.blogspot.com. For the anglophones reading this, "sin control" means out of control, or without control! It does not mean that she controls sin!! On your mark, get set, WAIT! !